shaman | That Was an Accident! Virtually every level 90 alt I have is working on the legendary questline from Wrathion! Sorta. 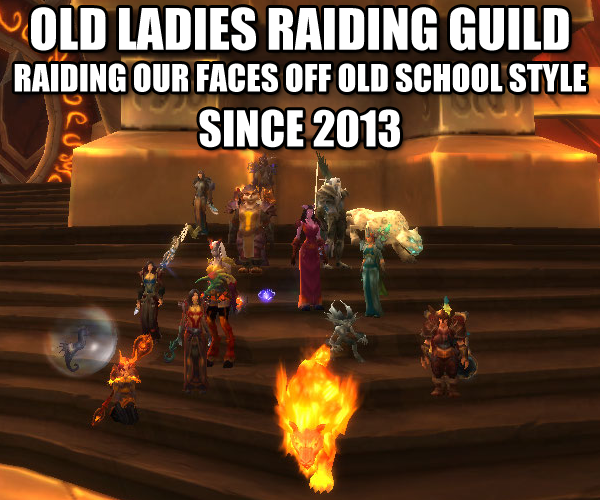 About 90% of them are still collecting sigils, because alts. (Did you know that the internet has made “because x” a legit form of speech?) 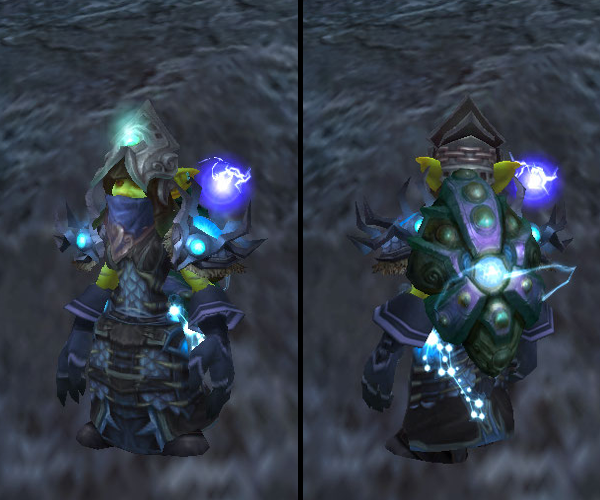 Originally, I wasn’t too thrilled about the whole cloak concept and dawdled a good deal. But ever since I learned that the legendary cloak gave you weird shiny wings, Bombelina’s been mostly serious about courting “Wrathie,” as she likes to call him (when she’s pretty sure he’s not listening). 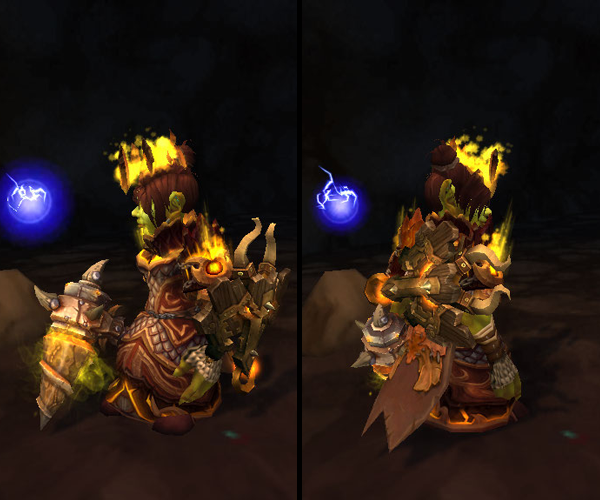 She finally derped around enough on the Isle of Thunder to get to Exalted status, and Wrathie-poo said that it was time to use the fancy Thunderforge! Hooray for progress! Bombelina almost complained because she was just there saving some scouts who were hanging around in their underwear, but she thought better of it and went with the flow. Her only major issue with this part was the fact that Wrathies insisted on working the forge himself. She wanted to do that, dang it, but I guess you can’t have it all when a dragon of dubious motives is involved. Afterwards, she sat herself down by Nalak in hopes of finding a group of fellow late quest-doers. 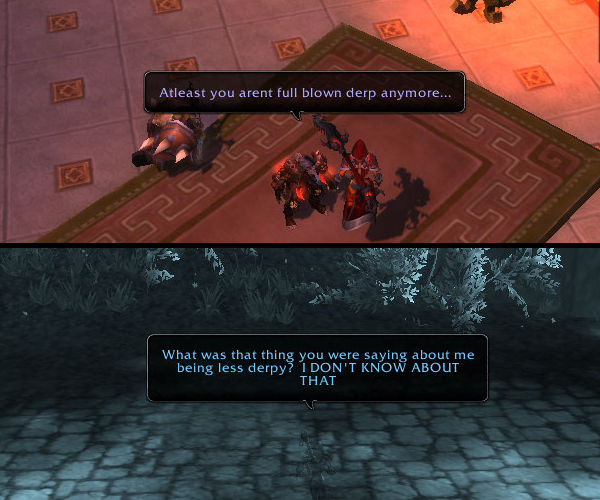 But it’s a cold, cold world on the Isle of Thunder in patch 5.4, since it’s old content and all. So after waiting for two minutes forever, she was (of course) still the only person standing around. 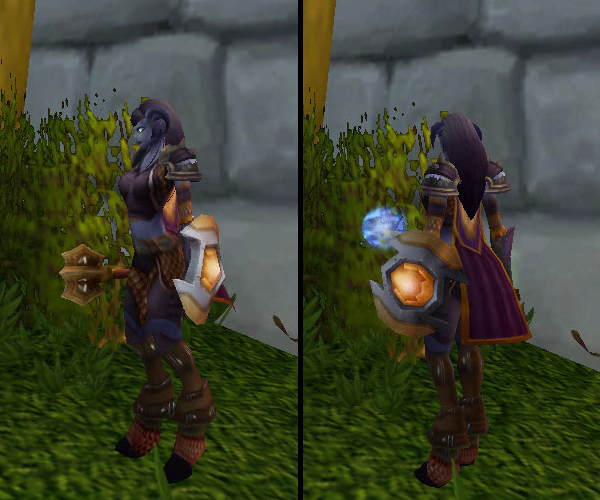 It seemed her goal of weird shiny wings would be stymied by her patch procrastination, but lo! All was not lost, for a guildmate volunteered to help her out. This guildmate had a plan for Nalak. It was a very good plan, mostly, except for the high probability of death. 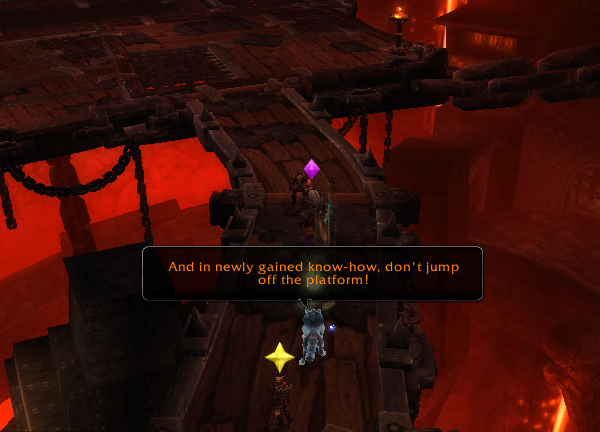 My guildmate’s too, by the look of it. Oops. This in turn led to a new header image, with Reggies portraying my long lost/ignored conscience. You know, that thing with the morals that you sometimes listen to? Yeah, that. Then came the Titan Runestones. 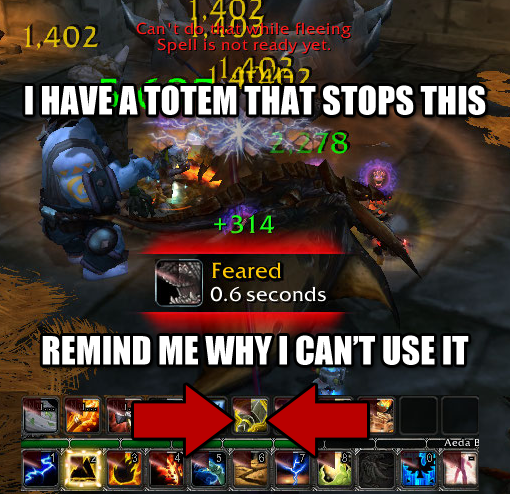 I still run ToT LFR out of habit and on multiple alts, so I’m accustomed to hearing people moan constantly about the drop rate. Me? Well, yeah, they don’t drop as often as I’d like, but you gotta keep in mind, I’d like a 100% drop rate. 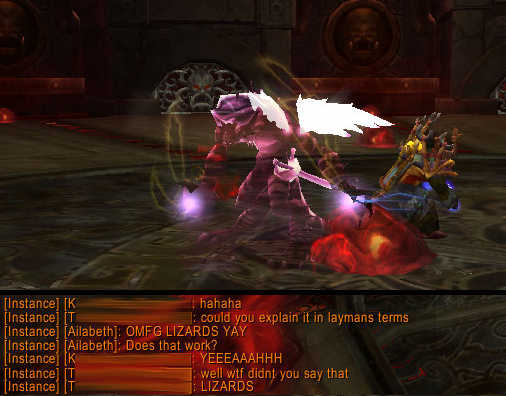 And anyway, I was so freaking far behind that getting the drops sooner vs. later really didn’t matter to me. Wrathieboo is supposed to tell you about Important Plot Points after each one you pick up, but I only saw him pipe up a couple of times. 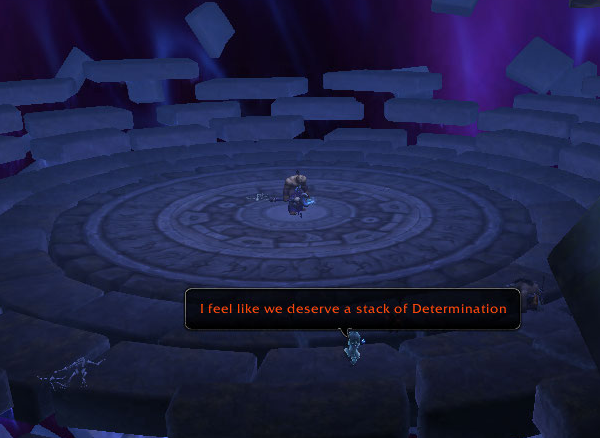 This is probably because when he DOES say something, it’s during that IMMEDIATE post boss phase when everybody is either complaining about getting all gold or ditching the LFR. This causes chat spam of course, which in turn makes it seem like these Runestones are just another quest requirement thing and not much more. SIGH. 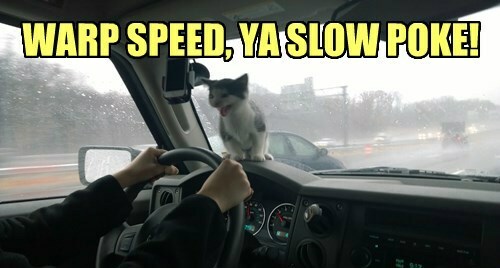 We’re going to have to work on his timing. Wrathie-baby, you can’t talk through things like this. 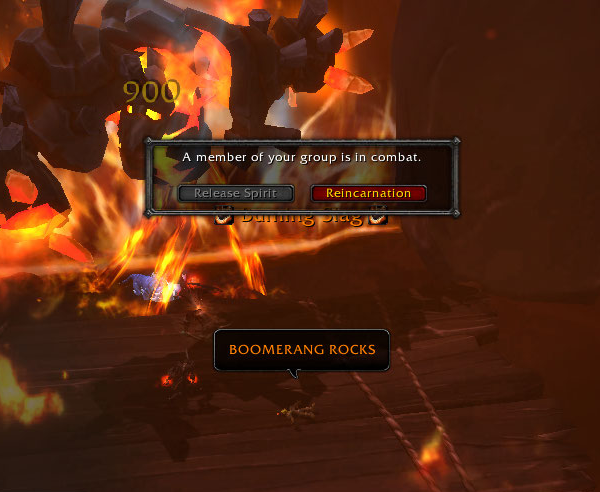 Speaking of poor timing (mine): Iron Qon probably thought I had it in for him last week, as I ended up killing him a total of FOUR TIMES in three days. 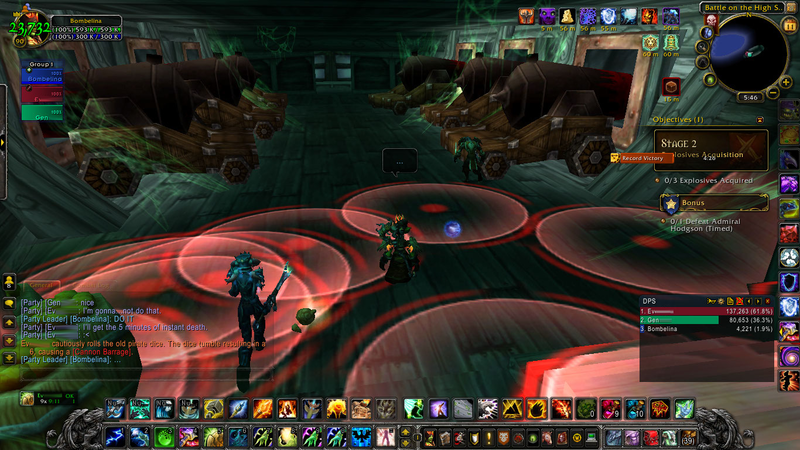 The first time, I’d totally forgotten about the server restart, and, well, the thing restarted after we offed him. 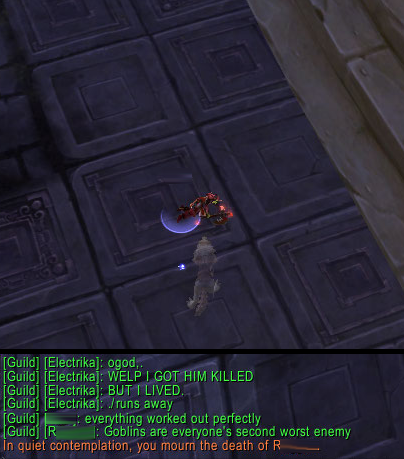 The second time, the queue to get in took too long, so after I killed him I wound up leaving for the guild flex run immediately after. The THIRD time I went through and murdered him was the trip where I got my last Runestones. And then Wrathion wanted me to go back for Lei Sheeyit’s crusty old heart (that’s three sizes too small), so I was forced to knock him off a fourth time! 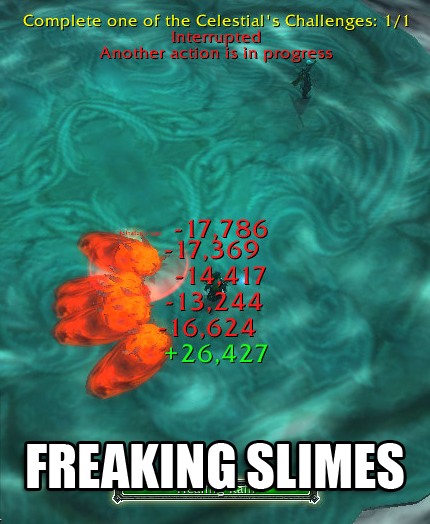 Cooldowns … or Weapons of Mass Destruction? 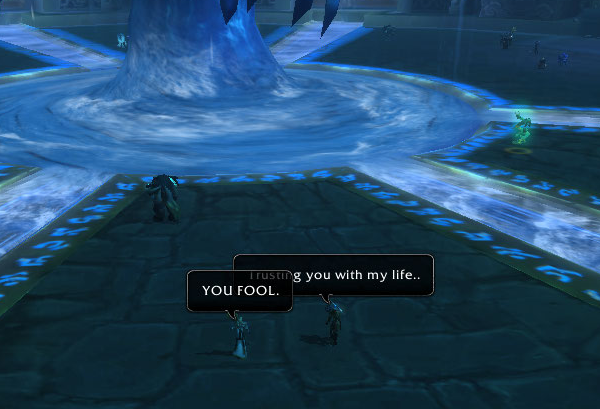 Shut up, Yu’lon. Seriously. Shut. It. Up. All the various platitudes and pearls of wisdom ya got are fine and dandy to listen to during/after the first wipe, but when you keep repeating them while I’m in the midst of the third or fourth attempt? Yes, DO tell me about paying attention to my surroundings in that high-minded, vaguely distracted tone you got. SCREW YOU. I OUGHTA FINISH THE JADE FOREST QUEST LINE AND BLOW UP YOUR STATUE. HOW’S THAT, HUH?! You wanna talk about the wisdom of knowing when to do freaking nothing, but you don’t seem to understand how this translates into, you know, NOT TALKING AND BEING ANNOYING. So Bombelina ragequit packed up and went to her other least favorite Celestial, Chi-ji. (Anything that hopefully mentions the hopeiness of hope tends to get her inner cynic up in arms.) 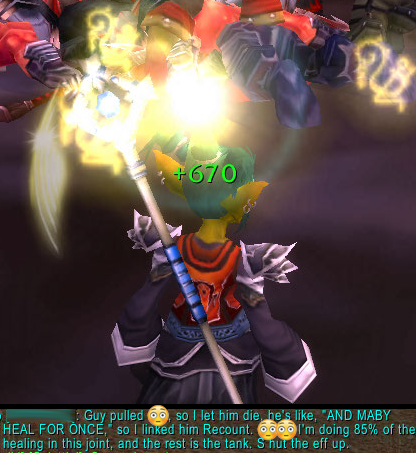 She wound up one-shotting the healing challenge there because lolz fate likes irony, and it wanted to point out that she really should’ve started here first. 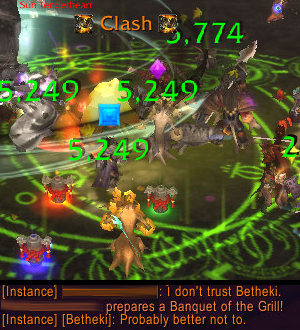 (My protip on which challenge to do: if you can heal LFR on a Sunday, you can do the healing challenge EASY.) She did have to help Wrathiepoo DPS his opponent, either because he is ungemmed and unenchanted or because he is just plain slow. Based on how hard he hit her when she didn’t get out of the way at the Jade Temple, it was somewhat surprising to see him be so dang wimpy in Krasarangarang. Slimes, do not want. Stop. No touchy. 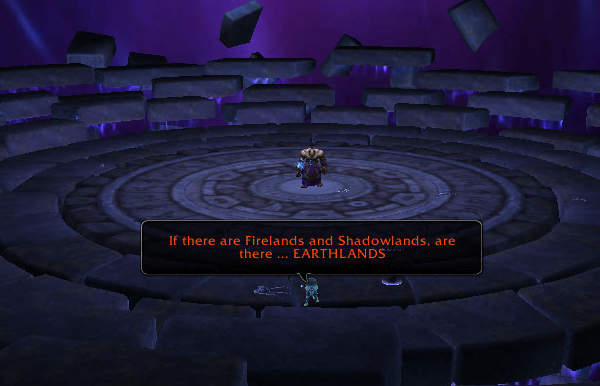 After THAT, it was time to take on the Celestials at the Timeless Isle. As it turns out, it’s really freaking hard to get a Celestials group if you’re there on Thursday. Or Friday. Or Saturday. Or Sunday. Or Monday. SIGH. 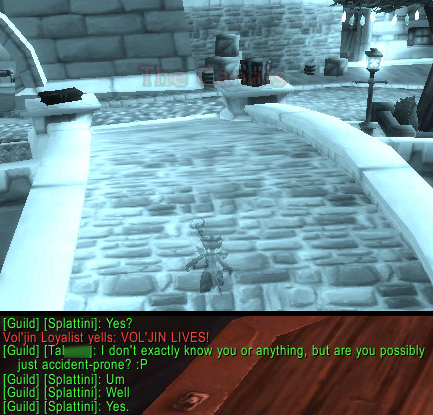 Unfortunately, because each Celestial DOES have to die to fulfill the quest requirements, there could be no sacrifice of guildmates a la Nalak. 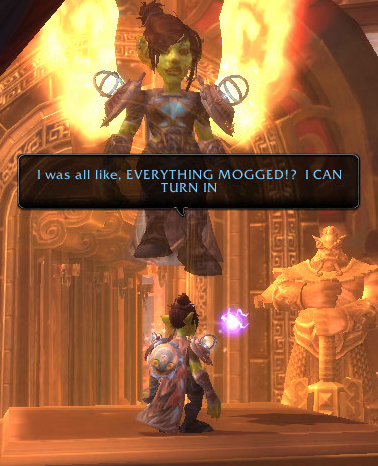 But you don’t tell a goblin no. BEHOLD! Check it! 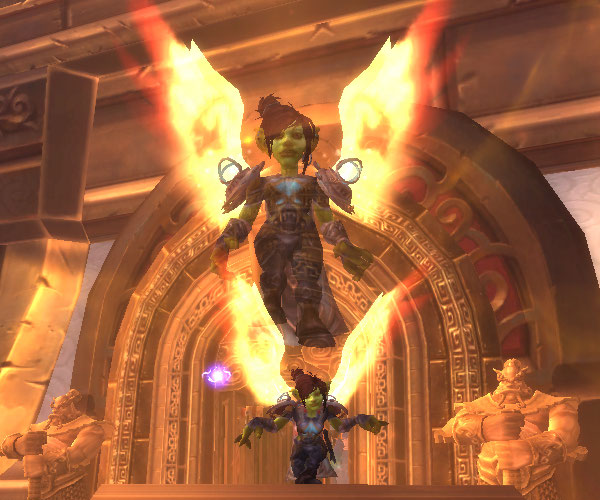 YOUR GODLY GOBLIN OVERLORD HAS ARRIVED. … and then other people got cloaks. Yes, I picked the one with the prettiest wings. It’s important. They may be warped, but I have them. p.s., happy holidays for those of you who do Thanksgiving! 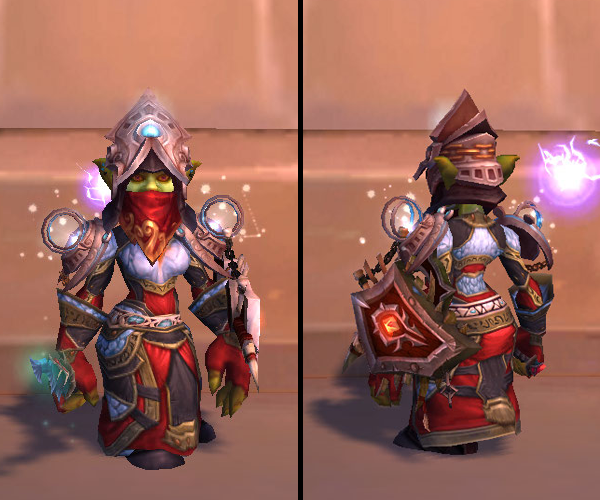 This entry was posted in Bombelina, For the Horde, Baby!, Goblins, World of Warcraft and tagged /omg, bombelina (formerly electrika), celestials, chi'ji, legendary, legendary questline, nalak, oh the goblinity, shaman, world of warcraft, wrathion, yu'lon on November 27, 2013 by Prinnie Powah.